So, you’ve just moved into your first home that has LPG gas. Gas regulators automatically modulate high pressure gas to a maximum pre-determined limit. Gas regulators for LPG gas bottles reduce the LPG (propane) pressure delivered to the gas appliances from the LPG gas bottles. Gas regulators for LPG gas bottles are usually factory pre-set to the standard operating pressure for the appliances. They can also be referred to as a cooking gas regulator when used with cooking appliances. The pressure within a gas bottle can be 800-900kPa vs the 2.75kPa typically required. The gas fittings include all the gas valves, piping and connectors required to build a complete LPG gas system, connecting the gas bottles to the appliances. Changeover valves determine from which gas bottle the gas is being taken. Licensed gas fitters are required for all gas related work, involving regulators and fittings, on homes and businesses. 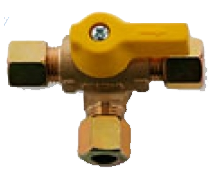 BBQ gas fittings involve less components than home installations, with typical BBQ gas fittings being a regulator and hose. The regulator and hose usually come as an assembly but hoses are also sold alone. LPG is stored under pressure as a liquid in a gas bottle. It turns back into a gas when you release some of the pressure in the gas bottle by turning on your appliance. The pressure within a gas bottle can be 800-900kPa. This varies based on the ambient temperature, exposure to the radiant heat of the sun and the amount of gas remaining in the gas bottle. However, the required appliance inlet pressure for Australian LPG gas appliances is typically only 2.75kPa. So, a regulator is required to reduce the pressure and ensure a consistent 2.75kPa is safely delivered from the gas bottle to your appliances. An LPG regulator reduces the high gas pressure from the gas bottle (over 600kPa at room temperature) to the required 2.75kPa pressure for the gas appliances. LPG regulators are an essential part of an LPG system, as without them regulating the pressure, the LPG would be unsafe to use. 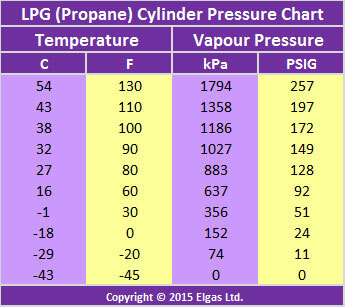 LPG regulators must reduce the high pressures as shown in the LPG Pressure chart above. The LPG regulator shown (right or above) includes an automatic changeover valve. Although the purpose of LPG regulators is the same, different applications may require different types of LPG regulators. The gas demand of the appliances determines what type of LPG regulator is installed. For example, if the combined megajoule (MJ) rating of your home’s appliances is quite high, an LPG regulator with a higher MJ rating would be required. Commercial sized LPG regulators are completely different and frequently comprised of two separate units. Also, please note that under no circumstances should a BBQ regulator ever be used on a home installation. Gas regulators have a diaphragm, which is a flexible rubber disc that responds to pressure changes and functions to regulate the flow of gas to the proper pressure. The diaphragm works in combination with springs and other parts within the regulator. It also works in conjunction with the regulator vent which allows the diaphragm to move freely. If the vent is obstructed, the diaphragm will not operate properly. The vent should remain free of dirt and debris to ensure the regulator operates correctly. The gas bottles are connected by tubing, known as “pigtails”, to a changeover valve and the changeover valve is connected to the regulator. Pigtails can be made of solid copper, rubber or braided metal over a rubber interior. Copper is generally considered the best choice, as rubber and braided pigtails have a limited life span. Also, pigtails can catch or trap debris over time so they should be replaced any time the regulator is replaced. Pigtails are "flexible" and will absorb the shock of sudden movement or jarring, if the installation is accidentally bumped or moved out of place. Without the flexible regulator connection, the piping would be rigid and more susceptible to leaks caused by movement. The changeover valve controls which gas bottle is in use, when two gas bottles are installed. Changeover valves come in two types, with manual (shown) and automatic changeover versions. As the names imply, manual changeover valves require manual intervention while automatic changeover valves automatically switch between gas bottles when the first bottle runs dry. If you have a portable gas heater, it will be connected to your home LPG suppplied using a bayonet connections. Bayonet connectors can be floor or wall mounted. The male connector, on the end of the heater hose, plugs into the female connector which is, in turn, connected to the LPG service piping. A gas line runs from the regulator to your appliances. This gas line is the service piping. It generally consists of copper tubing or flexible composite piping. The service piping needs to be installed correctly and legally, in conjunction with the gas bottles, for the entire installation to be safe and serviceable. Please remember that all gas installations must be carried out by a licensed gas fitter. You can find a licensed gas fitter in your area by using our TradeFinder™ map tool. In Australia, you would typically have two 45kg gas bottles. These are connected by tubing to a changeover valve that determines which gas bottle is currently in use. Changeover valves can be automatic or manual. Automatic changeover valves automatically switch from one gas bottle to another, when one is empty. There are different manufacturers and models of the automatic valves but they all have a visual indicator, which typically turns red when the first bottle is empty. This is when you need to order gas, before the second bottle runs dry. With manual changeover valves, you need to manually reset the valve when the first bottle is empty. The changeover valve has a lever which must be set to point to the gas bottle in use. 1. Turn the empty gas bottle valve clockwise to CLOSE the valve. 2. Move the changeover valve lever to point towards the second gas bottle, which will hopefully be full if the previous resident ordered gas when they should have. If not, just give us a call. 3. OPEN the valve on the full gas bottle by turning it anti-clockwise. Don’t forget to order a replacement gas bottle when you switch over between bottles. If you do it right after the first one runs out, you should never run out of gas. The information in this article is derived from various sources and is believed to be correct at the time of publication. However, the information may not be error free & may not be applicable in all circumstances.